I've just had the bolt in the attached picture delivered. It's for the bar end of a 2018. I noticed when I took the old one out it had (What I presumed) to be thread lock in the threads..... But this one seems to already have it? Will this just screw in and that's that, or does it need heating first? The old one needed heating before I could get it out. 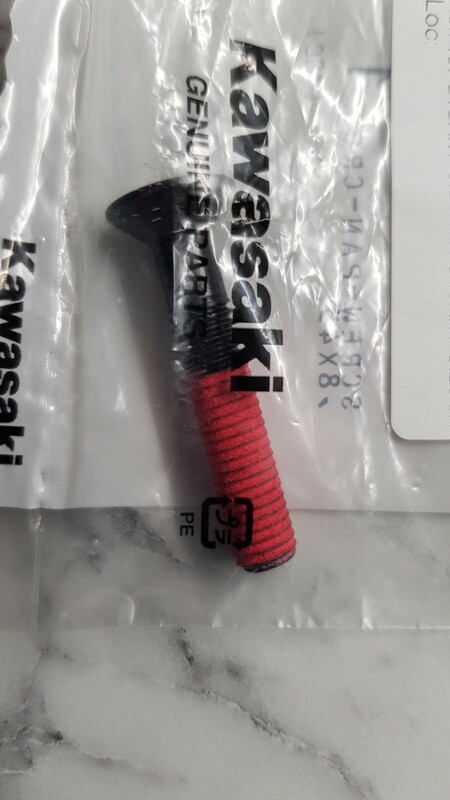 Re: Bar end thread lock? Just fit it as it is. It's common to have thread lock pre coated. Thank you! Despite tinkering with cars and bikes for years, I don't think I've ever come across that...... I went and bought threadlock earlier too!! As per L2RKE just fit it as it is. As you found, they are hard to get out and if it was me I'd remove a little of the thread lock before fitting. That's just me though! heated grips installation. I replaced with s/s allen bolts with just a smidgeon of threadlock on. Bar end removal is easy with the correct screwdriver, you will inevitably get 'cam out' and chew up the screws with an incorrect Phillips profile. 'There appears to be some confusion here over the type of screwdriver to use and I am sure problems occur where a Pozidrive head is used instead of the correct Phillips head. The two are NOT the same, the Pozidrive has additional flutes to give a higher torque but the Phillips has a rounded profile between the cross points. While it appears to fit the Pozi could chew up your bar end screw, you may of course get away with it if there is less thread lock'. I use a Vessel T bar No3x230mm and it fits perfectly with no drama, just keep pressure against the screw to avoid cam-out. I found this which better explains what is used on our bar ends: "Japanese Industrial Standard (JIS) cross-head screwdrivers are still another standard, often inaccurately called Japanese Phillips. Compatible screw heads are usually identifiable by a single depressed dot or an "X" to one side of the cross slot. This is a screw standard throughout the Asia market and Japanese imports. The driver has a 57° point with a flat tip." With the leverage using the Vessel driver my bar ends came out very easily keeping pressure against the screw, I used blue loctite when reassembling. The red screw thread lock makes life simpler when using a new screw. I just used A bit of heat on my bar ends (not enough to bubble the paint) and they unscrewed easily.